Home » What is the Global Impact Institute? developmental: we are convinced that every programme and every client ultimately seeks to improve over time, to become better, and therefore evaluation shall not aim predominantly at criticism but rather at identifying potentials for growth and development. Depending on the context and the data available (quantitative and/or qualitative) we may also suggest concept such as contribution analysis or UFE (utilization-focused evaluation), although in our experience none of the concepts can usually be used as a stand-alone and we prefer often a model that uses aspects of different models and theories specifically applied to a certain case. 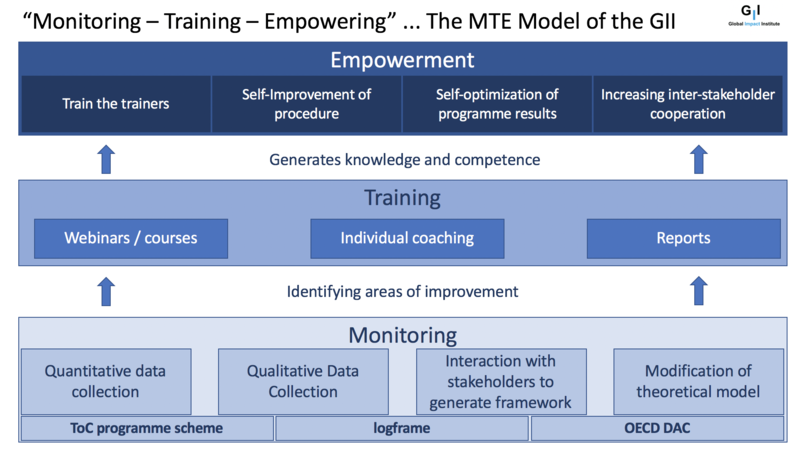 In addition, the GII developed its own model for successful and sustainable evaluations and monitoring, the MTE model which combines monitoring, training and ultimately empowerment. You want to internationalise your institution (university, business, foundation)? You wonder how to streamline your processes and link into the international networks? Our team has nearly a century of experience accumulated in the field of internationalisation. The GII has some of the most experienced experts in internationalisation. We can help you either from scratch, building your strategy, developing a monitoring scheme, helping you make the first steps; or we can support you on a much more advanced level, integrating mobility into degree schemes, helping assessing and/or setting up branch campuses, microsites, franchising or offshore programmes. We understand internationalisation as a means to an end, meant to improve your core activities (teaching, research, social engagement) and we are prepared to help you achieve effectiveness and efficiency in these activities. In all these areas, we also provide in-depth data-based impact assessments and monitoring. The GII engages in two main areas of activity in this field. If you plan to set up a funding programme or pro bono activity we can support you with expertise in the setup that will ensure that you achieve the goals you pursue at minimal costs and maximum effectiveness. On another front, you might be financing an exchange programme or support a social engagement activity; you might be running a pro bono project or regularly supporting a research organisation. You will want to know what effects your support really has, what is being achieved? We can run both, post-factum assessments and a proper monitoring scheme which takes your ultimate goals as well as possible unforeseen consequences into consideration before the programme or activity even starts. By doing so, you will not only substantially increase the efficiency of your investments but you will also strongly increase the credibility of your programmes or projects to the public. You are a university who wants to learn about its impact in the region and also educate its stakeholders about these impacts? You are an organisation or company, cooperating with universities in the region or wishing to so? You wonder about the effects and the impact this might have an your business? Or you are a regional authority interested in increasing the civic and economic effects of regional cooperation between higher education and the economy? Through the affiliation of the GII to the Professorship of its owner, Dr. Uwe Brandenburg, for Regional Cooperation and Impact of HE at the Universitat Rovira I Virgili (Tarragona, Spain) and the immense experience of Sir Eric Thomas as former VC of the University of Bristol and President of Universities UK, the GII specialises in in-depth analysis of regional cooperation and its impact and helps to build up successful cooperation schemes based on the years of experience of its staff members. We have specific regional competences in Europe, South-East and East Asia, and Latin America which ensures that the general expertise is grounded in regional in-depth knowledge. We can thus help you to use the full potential of such cooperation and increase the output multi-fold. You are a university or company and in need of internationalising your staff or improve their understanding of and for regional cooperation? Or you are a regional authority wishing to build capacity in your higher education and small and medium sized businesses? Then the GII is the right partner as we have all many years experience to turn empirically inferred analysis into practical down-to-earth training for staff members. Turning theory and data into practice is the speciality of the GII. Our trainings can be used as a part of a bigger scheme including monitoring and/or strategy building or they can be ordered as stand-alone options for specific purposes (such as internationalisation, university or company leadership, or impact improvement). We can support you through different training or coaching services: we offer Personal Leadership Coaching of Rectors, Presidents, Vice Chancellors, Vice-Rectors, Vice-Presidents or Pro-Vice Chancellors. In addition, you can participate in our Global Leadership Programme which is offered in selected regions of the world (please enquire). Not the least, we offer specialised staff in-house trainings ranging from strategy issues through organisational change to internationalisation in HEIs and SME companies. Therefore, we invite you to contact us to ensure the highest levels of efficiency and effectiveness of your activities using our in-depth and long standing experience in impact assessment. Our services to you range from pure consultation through training or pilot projects to full-fledged accompanied monitoring schemes.